Abercrombie & Fitch may not be as popular as it once was with teens, but investors liked the look of the retailer's latest quarterly results. Once a favorite of the mall-going set, Abercrombie & Fitch and its sister brand Hollister have struggled due to changing trends in teen fashion. Abercrombie & Fitch said sales fell 12% in the fourth quarter, which contributed to a 58% drop in quarterly earnings. Earnings were also dragged down by restructuring costs related to the closure of Gilly Hicks, the company's defunct lingerie and "knickers" business. But investors were expecting even worse. 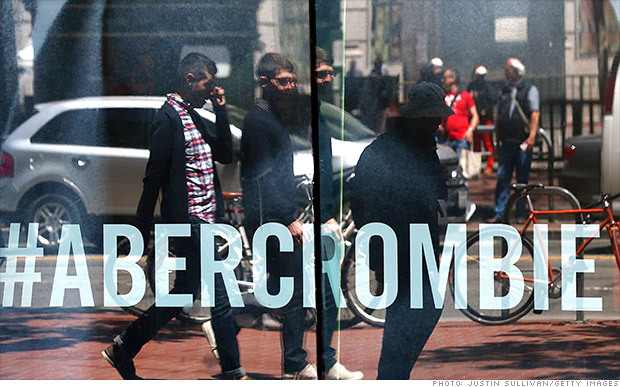 Earnings easily beat analysts' expectations, sending shares of Abercrombie & Fitch up 10% in midday trading. Shares of other teen-oriented retailers were also higher, including Aeropostale , American Eagle Outfitters , Wet Seal and The Buckle . Analysts said the improvement in earnings was driven largely by cost cutting. Abercrombie is expected to continue closing stores and reducing inventory this year, which should help the company meet its earnings targets. Investors also welcomed the company's decision to accelerate its share repurchase program. But the bigger question is what will Abercrombie do to regain the loyalty of fickle teen shoppers. Betty Chen, an analyst at Mizuho Securities, said the company has suffered from "self-inflicted wounds" Discount product design and pricing. Still, she added that If the company can come up with a product line that resonates with teens and is competitively priced, "you could see that customer come back." CEO Mike Jeffries told analysts on a conference call that Abercrombie & Fitch is facing a "rapidly changing, difficult and uncertain environment." But he was optimistic that changes the company is making will yield "meaningful improvements in our business." Still, not all analysts are convinced Abercrombie can regain its cachet. Abercrombie's latest quarterly sales "reinforces our thesis that the intangible brand asset has deteriorated and shows no signs of improvement," said Morningstar analyst Bridget Weishaar. And despite the stock's rise on Wednesday, shares are still down more than 12% over the past year. Jeffries has been under pressure from activist investors who say he's not acting in the best interest of shareholders. Abercrombie announced a number of management changes last month, including the appointment of a non-executive chairman to the company's board.